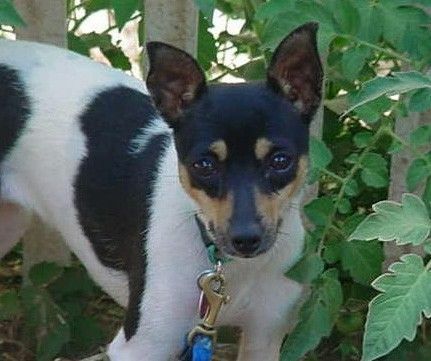 Tinker is a Rat Terrier or Toy Fox Terrier Mix, female. She was born approximately in January 2006. She weighs 8 lbs. She is crate trained. She’s very affectionate and outgoing, except when it comes to being picked up or walking on a leash. Currently any situation that calls for her to do either is extremely stressful for her, so training classes will be required for Tinker in her new home. Compatibility with other dogs depends mostly on their size. Cat compatibility is still being evaluated.